A man is dead and his girlfriend is fighting for her life after an early-morning car crash in Plano. 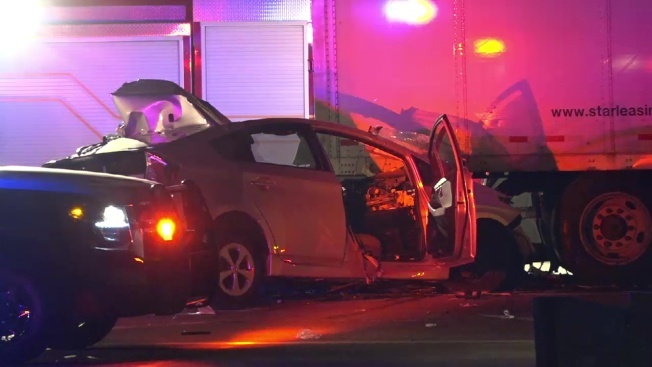 Police said the driver of a Toyota Prius slammed into a tractor-trailer on northbound U.S. 75 near the President George Bush Turnpike at about 2:20 a.m. The man driving the Prius — later identified as 25-year-old Christopher Paul Kreneck — was pronounced dead at the scene, according to police. Police said a 19-year-old woman in the passenger seat of the Prius was transported to a hospital in critical condition. The driver of the tractor-trailer reported minor injuries. Investigators have not said what caused the crash. Friends of the couple told NBC 5 Kreneck was taking his girlfriend home when the crash occurred. U.S. 75 was closed for nearly seven hours while the crash was investigated and cleared. All lanes of northbound U.S. 75 reopened to traffic just after 9 a.m.